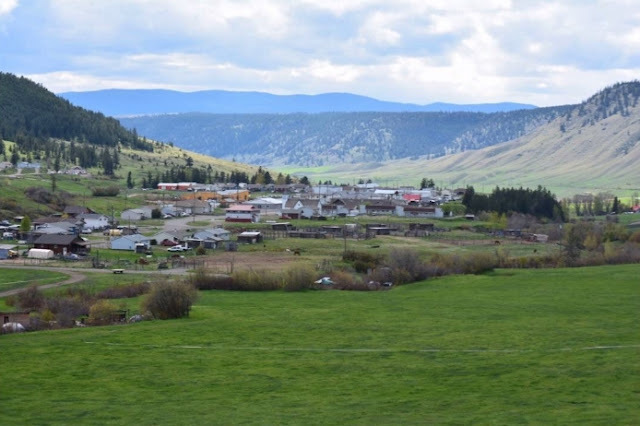 In a surprise move a Cariboo rancher has donated his land to Esk’etemc (Alkali Lake) First Nation after being a neighbour of the community for more than 50 years. “It’s significant because now there’s dialogue in this country about reconciliation and rather than talking about it he is doing something about it,” John said. 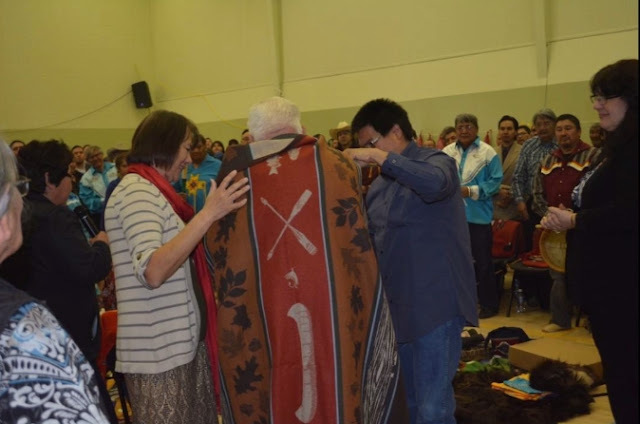 Chief Charlene Belleau announced Linde’s gift during a declaration of Esk’etemc title and rights ceremony and celebration held Monday, May 8 in the community at the Sxoxomic Gymnasium. Belleau said Linde had called the band office asking her to meet him at his ranch and surprised her with his offer. 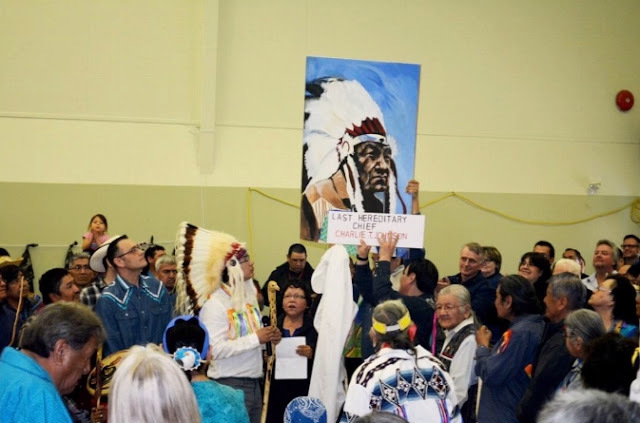 As he stood there draped in a blanket presented to him by the community, the community honoured him with a song, hugs and handshakes. “Look after the waters on the land,” Linde told the crowd. 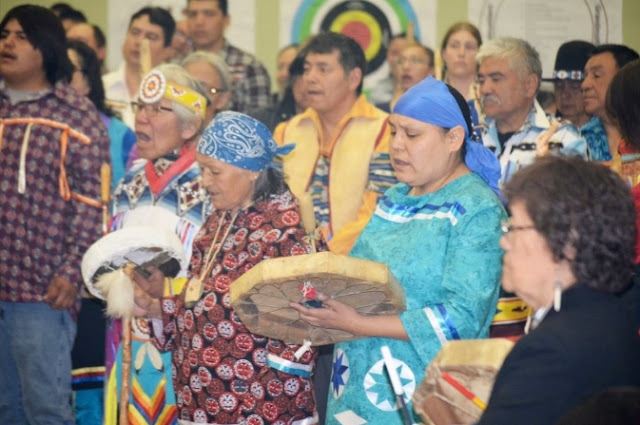 Hundreds of people attended the celebration, which began with a traditional pipe ceremony. Many were dressed in regalia and holding ceremonial staffs or feathers. The celebration and ceremony showed how the community is tying itself back to the land in a significant way, Grand Chief Ed John said. “The churches and governments for a long time tried to disconnect us from our land, languages and culture,” John said. Responses to "Rancher gifts land to First Nation during title and rights ceremony"
Mr. Linde, you are one amazing man. Your gift of land to the Esk'etemc First Nation is a well thought out future for the stewardship of precious land. If the majority of "whites" donnated their land back to natives upon their death. The Gov. would be hard put wouldn't it? Mr Linde is a wonderful advocate for good white men!! White people. A truly wonderful gift to The Esk'etemc First Nation who will take care of the land and the water. Such things are made from love and respect. Honor to Mr. Linde for his generous heart and thoughtful spirit. HO! What a beautiful thing! Back where the land belongs, and my heart sings. A terrific legacy has been established....simply wonderful. In this time of division and hate, you have shown yourself to be a leader among us...showing us to walk in the way of the Lord. What an extraordinary gift to the original people of America who have had so much taken from them. Bless you, sir. Most precious and wiseest gift of all. May the creator smile upon that man and his family, he has realized that we are all one family. 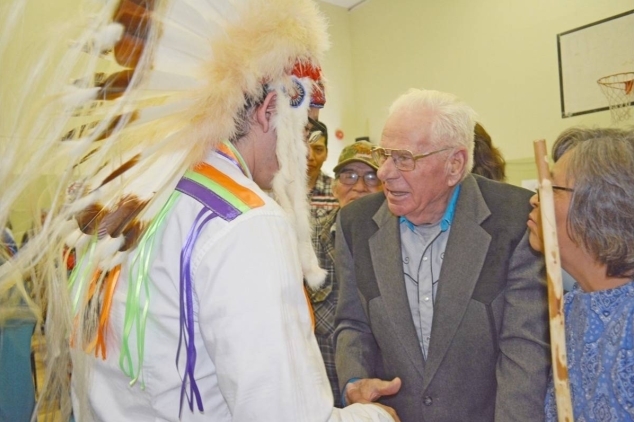 Blessings and honor to Kenneth Linde for returning this land to the Esk'etemec First Nation. Hopefully, others will follow his lead and return the land to the native people throughout the world. Kenneth Linde has recognized this land belongs to the Esk'etemec First Nation by rightfully returning it to them. A blessed man !